Left to right: George Frazis, David Hisco, Barbara Chapman and Andrew Thorburn. The chief executives of New Zealand's big four banks received combined pay of A$11.7 million (NZ$15.3 million) for their 2011 financial years with just A$3.6 million, or 31%, coming in fixed pay and the rest in benefits and bonuses. Annual reports from the banks' Australian parents show Westpac NZ's George Frazis was the highest paid in New Zealand, receiving A$3.5 million (NZ$4.6 million) for the bank's financial year ended September 30, but A$4.1 million when incentive pay from previous years, but received during 2011, is included. He's yet to actually receive A$800,000 worth of short-term incentives received for 2011 and A$550,000 of long-term incentives. For Frazis 2011 saw a drop from A$4.38 million last year. Westpac NZ had a strong year in terms of profit growth, with cash earnings for the year to September 30 up NZ$132 million, or 41%, to NZ$454 million from NZ$322 million the previous year. Westpac's net loans rose 3% to NZ$51.2 billion and total assets also rose 3% to NZ$52.6 billion. Next comes David Hisco, CEO of ANZ New Zealand, the country's biggest bank, after replacing Jenny Fagg last October. Hisco's pay for the September year totals A$3.4 million (NZ$4.4 million), but of that a combined A$1.2 million stems from long-term and short-term incentives that he's yet to actually receive. Fagg, who stepped down on September 1 last year, got A$2.13 million for the year to September 30, 2010. ANZ posted record annual underlying profit, up NZ$361 million, or 41%, to NZ$1.243 billion. Net loans and advances contracted 3% to NZ$93.613 billion, and total assets rose 3% to NZ$128.7 billion. BNZ's Andrew Thorburn, who is also parent National Australia Bank's group executive for New Zealand, Asia and the United States, saw his September year pay drop to A$2.6 million (NZ$3.4 million) from A$2.9 million with the main reason for the drop shares held being underwater to the tune of A$362,181 compared with being A$215,316 in the black a year earlier. BNZ's annual cash earnings rose NZ$88 million, or 17%, to NZ$612 million. Its gross loans rose 2% year-on-year to NZ$55.9 billion and total assets 1% to NZ$58.1 billion. Finally, ASB's Barbara Chapman who took the reins on April 26 after Charles Pink's departure last November. Chapman, head of human resources at ASB's parent Commonwealth Bank of Australia prior to April 26, received A$2.2 million (NZ$2.8 million) in the year to June 30, well down from A$4 million the pervious year, with the bulk related to her role at CBA. Again, the big reason for the drop was long-term share options being underwater, by A$166,344 compared with being A$1.3 million in the black a year earlier. CBA's annual report doesn't cover Pink's pay. ASB's annual cash net profit after tax rose by NZ$150 million, or 42%, to NZ$504 million. Its lending contracted 1.2% to NZ$53.2 billion and total assets fell by NZ$500 million to NZ$63.1 billion. In terms of fixed pay, Frazis also led the way with A$969,696, followed by Hisco with A$960,000, Thorburn at A$926,000 and Chapman on A$747,922. In other remuneration, Frazis was awarded an A$1.2 million cash short-term incentive, A$52,882 non-monetary benefits such as health checks, tax advice and living away from home expenses, A$18,324 of superannuation benefits, A$399,634 worth of options and A$899,680 in share rights. A total of 71% of his pay was performance related. Hisco was granted A$1.6 million worth of short-term incentives - including shares granted in 2007, 2009 and 2010 - and A$480,000 worth of long-term equity incentives. He also got A$357,283 worth of "other grants/benefits" such as flights, housing assistance and tax services. Prior to his appointment as ANZ NZ boss Hisco was commercial managing director for Australia at parent ANZ Banking Group. Meanwhile, Thorburn's remuneration included an A$637,500 cash short-term incentive payment paid on October 31, A$30,904 worth of non-monetary benefits such as motor vehicle benefits, health fund and tax advice, A$50,041 of superannuation, the shares underwater to the tune of A$362,181, and A$1.3 million worth of options and rights. Chapman's remuneration included A$431,420 of cash short-term incentive payment and the same sum of deferred short-term incentive payment, A$38,297 of other pay covering the likes of tax advice, club memberships and relocation costs, A$41,096 of superannuation, A$6,346 in long service entitlements, the performance rights at risk underwater to the tune of A$166,344 awarded in 2009, and 2010 and 2011 share and rights awards worth A$652,789. In May international banking regulator the Basel Committee on Banking Supervision issued a report on aligning bank executives remuneration with risk and performance. 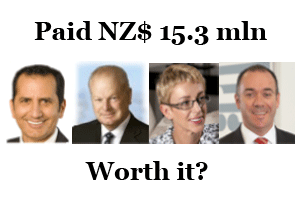 Asked by interest.co.nz for its views on bank executive pay at the time, a Reserve Bank of New Zealand spokeswoman said it wasn't something the bank had a comment on. The four most successful farmers..of New Zealanders...and fully supported by the NZ govt...and the RBNZ...didn't they do well....now you know why all Australians call their banks Bastards. A boy, who steal a surfboard - he get 20 hours community work. CEO's, who steal millions - they get a free dinner at the board meeting of other "money - surfers" - talking about outrages high minimum wages of $ 15.-. Why - as a society do we accept that ? I want to make a term or 2 stick to these people. This is "fiscal child abuse" or "mortgage slavery". The many people who try and drum younger people, sometimes including their own children, into buying their own first home under these market conditions, are fiscal child abusers. Time the young people wised up and started "occupying" the local council planners offices as well as the streets the banks head offices are on. Doing a bit of simple maths proves that it is far more costly to the mortgagee and far more profitable for the banks, if interest rates are low and house prices high; rather than the other way around. Baby boomers grizzle that they went through periods of mortgage interest rates of 18 to 23 percent. So what. It was still far cheaper for them to get a house at 3x a single income, financed at 20%, than it is for the young today to get a house at 6X a double income, financed at 6.5%. When interest rates were 20%, inflation - and rises in incomes - were of course something like 15% to 18% per annum. So after a few years your mortgage did not look like much, did it? PLUS, interest rates came DOWN since then and these moaning hypocrites had the lot paid off in only a few more short years. NOW, our young couple with a mortgage several times bigger relative to their incomes, have no such chance that interest rates will be LOWER for any significant part of the time during their lifetimes; in fact we are in such volatile times that a few percent points increase in interest rates and the bankruptcy of nearly every young household who bought their first home since about 2003, is actually quite likely. People in this category infest this site and it is time they started to incur the opprobrium they deserve. Earlier, more christian, more moral, more rational generations would be turning in their graves if they knew what we had come to. An elderly NZ academic recently commented to a friend of mine, "I am surrounded by zombies here at the uni". He said the single worst lie of political correctness, was "the rate of solo motherhood has no consequences for society". Close behind that, is the "evil anglo saxon imperialist, poor noble savage" treaty industry edifice of lies. He is not a specialist in housing issues, but I rate the "environmental hustle"/urban growth containment racket as right up there with these lies and irrationalities. The great comfort is that they are pillaging their no capital return shareholders as well. I look at this a different way. I have spent a significant portion of my working life keeping a safe environment for these bank CEO's to operate in. As far as I am concerned they haven't actually fully settled the account for services rendered, what they paid me was just an installment. I will be looking for the rest of the installments at some point. See the the skills I developed means that when the government can not pay for their security any more, then there won't be a lot they can do about stopping me from some debt recovery. Maybe change the icon as you hover over them.. :) Interactive game maybe? Considering how much help they get from Alan Bollard and the reserve bank.... the least they could do is give Alan Bollard a Xmas turkey..!! Some would say the have a licence to print money. Thankyou bank CEO's : You have contributed $NZ 2 billion of profits to your shareholders , but accepted less than 1 % of that figger for your personal renumeration ...... well done ! ..... most of the fat-heads running Kiwisaver funds take 2 % p.a. as a fee .... regardless of whether they make a profit for the policy holders or not . And in a good year , they'll skim an additional 10 - 20 % of the profits above a NZX benchmark return . By comparison , the major bank CEO's are a bargain . Well as they GBH..."that's fishing"...or phishing if your Nigerian . Slow news night indeed....very disapointed in Bernard not taking me seriously on Mondays 90 at nine....as he's probably seen the news tonight.....and realises he missed the boat....what a putz.......cheeses what an empty cone.....I give him something to put in it and what does he do..? drops it ..! whaaaaaa! sniff..sniffle whaaaaa. Enjoy mon ami......The platitudes of our sweet if somewhat well rounded Mistress should not go unheard...! Listen if only for the sake of my ignorance ...that I may become a better person for having her diatribe visited upon me. Gummy's portfolio is padded with the sweet stuff huh? To be fair, I think the average is closer to 1% p.a. but who really knows as there is NO regulated transparency. The sooner the MED gets its act together, the better. Trust life is treating you well Gummy? ....... trust & fund managers are even bigger buffoons than me , and that's saying something , hon ! I missed you on Friday Amanda....my sense of humor was being sorely tested by my argumentitive wife it ended with me telling her when she dies all her epitaph is going to say is....Here lies my cold dead wife..! To which she responded yeah well all yours is gonna say is...Here lies my poor dead husband ...stiff at last..! What do people expect when you have a legally protected cartel? Peoples. Jealousy is an ugly trait. Fair play to these CEO's who are the highest paid executives in the whole of NZ. Compare their wages to the larger businesses off shore and their wages will seem like small change. I agree, how much does one need to earn and their wage has no real need to appreciate further, but what is the point of this article other than to flush out the usual tall poppy syndrome that permiates NZ society. Australian Banks employ a significant number of people (ANZN >10,000) who pay PAYE, a moderate amount of NZers are shareholders meaning not all profits head 'over the ditch'. These Banks now contribute significant tax revenues as well. The Reserve Bank Act ensures sovereignty is maintained. And remember, if all the Banks had been NZ owned during the financial crisis of 2008 onwards, our country would have had to have removed risk from the private to the public sector. We would intrinsically understand the word bailout. The Aus paretns ahve saved us a lot of grief contrary to popular parochial belief. The New Zealand taxpayers (current and future) did underwrite the OZ banks from 2008 . We did not own them, nor did we take any of the profit but we did hold the risk. What a great deal. And before everyone just blames Cullen, remember that English did not have to just pray and forget, he could have done something about it when he became Finance Minister. Excessive pay for very straightforwar admin jobs like Bank CEOs in a ologoply banking environment need to be kept well under control. These people are not risking there own money, the are not entreprenuers, they are skilled at rising in a corporate environment, that is all. They money they get in excess of what they are worth to do the job- max 500,000- more like 250,000 is because, in part ,of capture of the enconomy and political system by banking elites. We definitely have to stop them meeting MPs outside of select commities. All those rubgy games and lunches do us no good at all. The workers are paying the PAYE not the banks, alltough it could be argued that PAYE is becoming more like a payroll tax that companies that offshore jobs do not have to pay. Another good reason for a LAND/WEALTH Tax. Governemnt should issue its own money rather than debt based money- letting banks do it just shows how much they control us, not us them. Thank you Plan B for confirming my 'tall poppy' statement. You are correct in that risk was transfered to the taxpayer in 2008/9 (can't remember exactly when the GG was put inplace) but I'd suggest that it was cost neutral unlike the direct bailouts in the US & EU, the QE exercises run in the US & UK (dilution of wealth) and the subsequent austerity measures that are creating contagion in the EU. Excessive pay for very straightforwar admin jobs like Bank CEOs in a ologoply banking environment need to be kept well under control. While I agree $5m appears excessive for CEO of Bank in NZ have you got any idea what a CEO of a bank actually does, what skills they have etc. Have you actually looked inside a Bank's workings? I suspect not but you could always apply for a role at Kiwibank when one comes up!!!!!!! Surely part of the answer to high big 4 bank profits is that NZers are for some reason customers of these banks. I moved my deposit money to Kiwibank and if i took out a mortgage again i would hope to remain with kiwibank. Popular support for Kiwibank with actions rather than words will cause the big 4 to operate differently. It will also show politicians who made it so hard for Kiwibank to be started to realise that there are votes to be gained in looking after NZers rather than whatever they think they can gain from looking after Australian interests. But NZ of course needs Australia and cannot operate in a vacuum without it. So presumably the strength of the big 4 also has something to do with the trading relationship NZ has with the much larger Australian economy where without Australian ports and trade i would guess trade for NZ would be much much harder than it is at present. In the real world if you want to trade with your neighbours you need relationships with them that suit them and if they are bigger than you then they are going to call the shots. Where does that figure of 4 come from? By regulation banks have to provide an amount of relationship between the time period of money borrowed and the time period of money lent. So if a bank creates a 30 year loan and charges a variable rate of interest on some annual local rate it also has to in some manner have additional lending by longer term financing at say 10 year rates by regulation. The RBNZ made a big deal during this crisis that the banks have to avoid being overly reliant on local and short term deposit funding and get more of their funding from sources outside of NZ and for longer terms. Local funding would probably tend to be short term via retail deposits at call and so forth plus there is the short term 90 day bill market even if that comes from overseas. Around 62B has to be rolled over every 90 days via 90 day bills. MF global, Bear Stearns and Lehmans collapsed because they were reliant upon short term wholesale funding and investor confidence for that 'just in time' delivery of working capital, where failure to renew those loans meant they needed to get longer term funding at a time when nobody was willing to provide it. I bank also with Nordea in Finland. Obviously nordea as one of the strongest banks in the region has no trouble getting the longer term financing it needs and rates are cheaper here. Just recently the big 4 australian parents had rapidly rising CDS and it appeared confidance was evaporating. For now CDS is much lower. Here's one that'll make Parky happy.. But as I have pointed out many times parky.... "we need to shelter this power to create money from vote-seeking politicians"
Currently the Farm is owned by four big fat banks..back to work you go peasant. Ridiculous and obscene income for one person, to think the people below them are bearly getting by and then these guys lay them off and they can't afford to live. Banks need to be in line with the Government salaries as they have a prviledged position.